Considerable control is called for while reimagining myth so that it does not degenerate into fantasy. The first successful attempt at this with the Mahabharata was by the Bengal civilian Nabin Chandra Sen in his Bengali epic trilogy, Raivatak, Kurukshetra, Prabhas (1887-1896). Gajendrakumar Mitra did so in the novel Panchajanya (1963), a trend continued today by Dipak Chandra. In Gujarati, K.M. Munshi recreated Vedic India and the Mahabharata in Bhagwan Parashuram and the unfinished octology Krishnavatara. In Hindi, Gurudutt, Acharya Chatursen and Narendra Kohli novelised Vedic and Puranic India. Marathi, Kannada and Malayalam fiction drew upon both mahakavyas. In English, in the 1980s came Maggi Lidchi-Grassi’s magnificent Mahabharata trilogy exploring the psychological quests of its characters. Ashok Banker started off a rediscovery of Indian myth as fiction with his Ramayana heptalogy. This stream has grown from a trickle in the late 1990s to a gushing river by 2015. What is particularly interesting is that now engineers and management executives are turning to this massive narrative heritage to create novels. Unfortunately, except for Krishna Udayasankar’s Aryavarta trilogy and Rajiv Menon’s Thundergod, the rest leave much to be desired in terms of language and style. Since most Indian publishers scrimp on editors, these flights of mythic fiction are riddled with errors of idiom, spelling and grammar. This is where Ramakrishna’s debut novel—the first of a trilogy—comes as a welcome surprise. A software architect with a doctorate in computer science from Carnegie-Mellon, reading him is a rare pleasure. He reimagines the events as occurring in 2000 BC. This is India north of the Vindhyas with a non-literate oral culture, bereft of iron, horses and chariots, with onager and cattle drawn carts, mud wattle cottages, bows, arrows and bronze weapons. There are no missiles, no aircraft, no huge gem-encrusted palaces and gleaming silken attire. But why are there no ornaments when archaeological evidence exists? Beginning with the reminiscences of the dying Kuru patriarch Bhishma is not a new device. Pratibha Ray used it very dramatically, opening Yajnaseni with Draupadi’s life flashing before her dying eyes. In somewhat similar fashion, the dead Karna speaks to us in Shivaji Sawant’s Mrityunjaya. The Mahabharata is a series of extended flashbacks at several levels, beginning with Dhritarashtra’s plangent lament over past incidents that presaged no hope for victory—tada na shamse vijayaya sanjaya! However, Ramakrishna does start with a shock: Bhishma, ambushed by Shikhandin (his son by Amba), kills him and is shot by Arjun. Vengeful Amba drives the arrow deeper into him. Ramakrishna creates the Kavi Sangha, a guild of bards, functioning as the memory of over 2000 matriarchal communities led by the Purus, trading with Mesopotamia, Persia and Egypt. Ramakrishna calls Egypt “Pitri-vihara-naad”, the land of temples to ancestors, although its original name still remains “Misra”, a mixed people, harking back to the Bhavishya Purana which speaks of sage Kashyapa with his son Misra going to that country and Brahminising the people. As the Sarasvati basin dried-up, the Purus migrated from Panchanad (Indus etc.) to the banks of the Yamuna and Ganga, establishing Hastinapur as a trading outpost to the east. In the process, they pushed out the slash-and-burn Naga culture and clashed with the hunter-gatherer Rakshasa tribes. A transition occurred from a matriarchal trading and forest-based life to a patriarchal urban society with an army of farmers. Ramakrishna is quite the geographer, drawing a clear picture of the how the changing courses of rivers brought about changes in prehistoric cultures. He is an ethnographer too, providing details of the matriarchal, matrilocal and matrilineal cultures at tedious length. He is also a linguist discoursing on the Phoenician alphabet used by the trading “Baoga” (Sanskritised “Bhargava”) and the development of a phonetic, metrical script (Sanskrit) by Vaishampayana, who is prejudiced against writing. He is persuaded to dictate the memorised archives to a Bhargava scribe, as narrated by Bhishma to the archivist Lomaharshana in the presence of the Vyasa named Shukla, Satyavati’s brother. The problem is one of verisimilitude. Nowhere in Indian myth are the Nagas depicted as matriarchal. Ramakrishna could easily have kept to the original Nishada descent of Satyavati without any problem. The Nagas were an ethnic group living in and around the original kingdom of Yayati at Khandavprastha which the Pandavas reclaimed as Indraprastha. Ramakrishna creates a siege of this city by Suyodhan who cuts off the water supply, foolishly allowing the Pandavas to escape into the forest. He goes to great lengths to set up Bhishma as the dynast of a trading family who builds an army to establish a comity of communities along the Himalayan foothills against Saka inroads. The proposition may not be difficult to swallow for readers unfamiliar with the Mahabharata. The Kavi Sangha’s chief is called “Vyasa”. Anachronistically, Ramakrishna makes Vasishtha and Vishvamitra precede Bhrigu as Vyasas. This guild functions as the Chanakya-like advisor to the ruler, imposing a one-child norm on migrants from Panchanad to the Kuru habitation and upon the Nagas who are the crop-growers. To set an example, Shantanu has to do away with all his sons from Ganga born after Devavrat. Ganga commits suicide in despair. Devavrat, though taken with Satyavati of the Meena-Nagas (also called “Matsya”), sacrifices his desires for his father’s sake. Satyavati’s brother Shukla spins the plot whereby her sons get the throne instead of Devavrat—an interesting twist. Another innovation is in the death of her son Chitrangad, rashly attacking marauding horse-riding Sakas. Ramakrishna paints a gruesome scene in which Devavrat, finding that the Sakas have blinded Chitrangad and torn out his tongue, secretly cuts his throat to spare him further agony and spreads the tale that he was killed by Gandharvas. 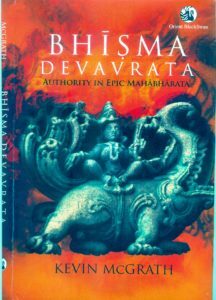 Devavrat acquires the sobriquet “Bhishma—Terrible” because of his horrific torture of captured Saka families in revenge. From the Sakas he rescues the Naga maiden Amba, falls in love with her and brings her with her two sisters to Hastinapur. Satyavati constantly upstages her co-regent Bhishma, even forcing him to have the widowed queens live in his palace so that they imbibe the true Kuru aura, pleading that physicians have so advised! Bhishma is shown to be clueless about what was happening within the palace, always busy with constructing water-works and building an army to establish an empire. There is no mention of the levirate custom. Amba, driven away Satyavati when pregnant with Devavrat’s child, delivers Shikhandi among the Panchals, the traditional foes of the Kurus. Ramakrishna’s Panchals are a standing Naga army set up to tackle the rogue Naga band led by Takshaka. Draupadi is the matriarch of the Panchals, Krishnaa Agnijyotsna, the Dark Lady. Whatever happened to King Drupada and what is gained by naming Drona “Kutaja”? Unaccountably, Ramakrishna makes Dhritarashtra the son of the younger Ambalika instead of Ambika, whose son he names Mahendra, called “Pandu” being an albino. Disagreeing with Bhishma’s policies, Mahendra exiles himself. Duryodhan repeatedly shouting “Shut up!” at his father jars because in the Mahabharata he does not insult Dhritarashtra, as he draws all his authority from him. The grand heroic scale of Devavrat’s vow is diminished drastically. There is an incongruous reference to the Roman deity Saturn as arbiter of fate on page 415. The novel ends with Bhishma’s shock at discovering from the Vyasa Shukla that Dhritarashtra and Pandu were not of Vichitravirya’s blood, but are progeny of the son of Parashara, the earlier Vyasa, and Satyavati. This is a signal departure from the original where it is Bhishma who advises resorting to levirate by an eminent Brahmin and assents to Satyavati summoning her illegitimate son Vyasa. However, Ramakrishna’s insight is correct, that neither of the contending cousins had any Kuru blood in them. At least Dhritarashtra was Satyavati’s grandson, while the Pandavas are not her grandchildren, each having a different, unknown father. Thus, the Kavi Sangha, guild of bards, came to wrest the throne from the trading dynasty of Purus. Ramakrishna may have drawn inspiration from the Brahmin Pushyamitra Sunga wresting the throne of Pataliputra from his Mauryan master. The book has an excellent map, a helpful family tree and a descriptive glossary of names. For a welcome change, there are practically no typos and the novel reads very well, except that it could have been tighter by omitting the excursions into geography, linguistics and ethnography which the appendices cover in detail. We certainly look forward to the sequels.